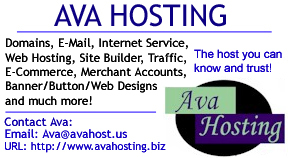 Ava Hosting - The Host you can know and trust! The lowest prices on private domain name registrations, web hosting & Design packages, Email, Traffic Blazer, Free dialup and premium internet service, DSL and more! Web site hosting -Now with MYSQL, PHP and Perl Supported. Use our online easy Sitebuilder or other program to design your site. GREAT support overseen by Ava, who is always available to answer questions! We can also get you a qualified Web Designer or other services to fit your needs. AvaHosting- The Host you can know and Trust! Traffic Blazer- prepare, analyze, optimize and submit your Web pages to key search engines and directories. Premium and Free dialup. High Speed DSL Internet service and more! A merchant account through AvaHosting lets you accept credit cards - secure, fast, and hassle-free! There is a $ 3.99 sale on domain names going on right now! We have a sale on now! .us and .biz domain names, and Web space starting at $5.95! - up to 100 MB storage space - upgrade for more! The best domain names are already registered but might be for sale! Search here! Compare our services to the non AvaHosting advertisements below!